Arya Hotel & Spa - Kuta, Bali, Indonesia - Great discounted rates! 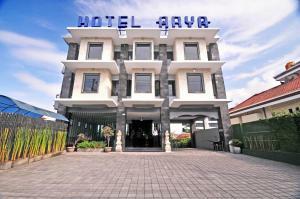 Ideally located in the prime touristic area of Kuta, Arya Hotel & Spa promises a relaxing and wonderful visit. The hotel offers guests a range of services and amenities designed to provide comfort and convenience. Free Wi-Fi in all rooms, 24-hour front desk, facilities for disabled guests, car park, car hire are on the list of things guests can enjoy. Comfortable guestrooms ensure a good night's sleep with some rooms featuring facilities such as air conditioning, wake-up service, mini bar, balcony terrace, television. Entertain the hotel's recreational facilities, including spa, massage. Friendly staff, great facilities and close proximity to all that Bali has to offer are three great reasons you should stay at Arya Hotel & Spa. Arya Hotel & Spa - Bali classifies itself as a 2 star hotel.